October 29th, 2004 - Letter from Rick Baker, Mayor of St Petersburg. Letter received by email on September 13th 2004 from the Bullard Group. I have received numerous calls asking about all of the improvements taking place on our entry roads (Egret Blvd, Lake point Drive, Heron Blvd, and Whisperwood Drive). When this property was developed, approximately 30 years ago, it was intended that these roads be dedicated to the community, however they were not deeded due to an engineering oversight or some other reason of which I am not certain. A public hearing originally scheduled for Tuesday August 17th 2004 has been postponed until Tuesday Oct 5th 4 p.m. 2004 and will be combined with a similar land use and zoning hearing for the commercial property annexed by the City of St Petersburg around the Egret entrance to Feather Sound. Letter from Pinellas County Vice Chairman John Morroni - Annexation of Feather Sound On July 18, you sent me an email expressing concern about annexations in the Feather Sound area. As you are aware, the City of St. Petersburg has annexed a commercial area on Ulmerton Road, which is south and east of Heron Boulevard. The owner of this property was willing to have his property annexed apparently in exchange for certain financial incentives offered by the City. I should note that our County did pose several questions to the City regarding this annexation as to its appropriateness and the ability of the City to serve.. The St Petersburg planning department reported that there were no letters, emails, calls or correspondence regarding this annexation except for a letter from Pinellas County stating their concerns and objections to this annexation. The annexation process was final 30 days after the final hearing of July 15th. Should Feather Sound be annexed by St. Petersburg? Rick Baker, Mayor of St. Petersburg is asking Feather Sound residents this question. The text of his letters dated October 29th, 2004, November 4th 2003 and December 23rd 2003 are presented below. 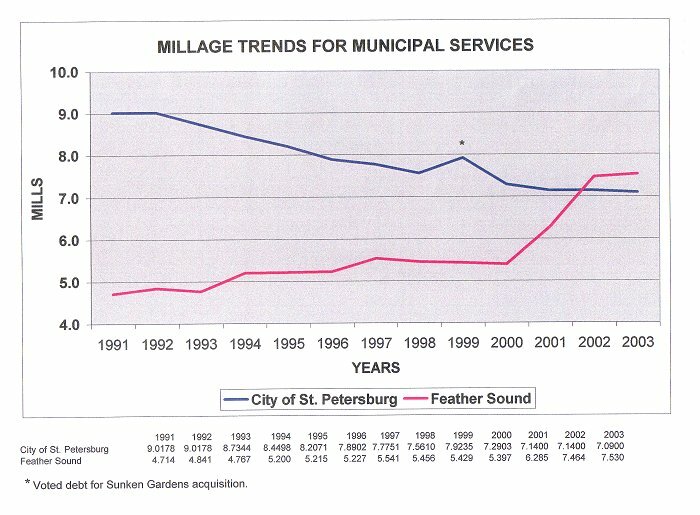 The November 4th letter states that property taxes in St. Petersburg are less than in Feather Sound. This is correct, however there are other costs that need to be considered. Residents of the City of St. Petersburg are charged taxes on utilities including electric at a rate of 16%. If a home electric bill averages $150/month or $1,800 a year then a 16% tax on the bill would be $288. This is significantly higher than the property tax difference for most property owners. It appears that most property owners would pay more taxes if Feather Sound is annexed by St Petersburg. 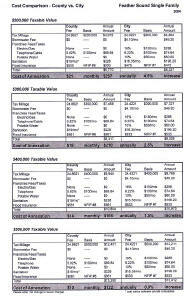 Pinellas County Assistant County Administrator Mark Woodward has prepared a comprehensive analysis of the costs. 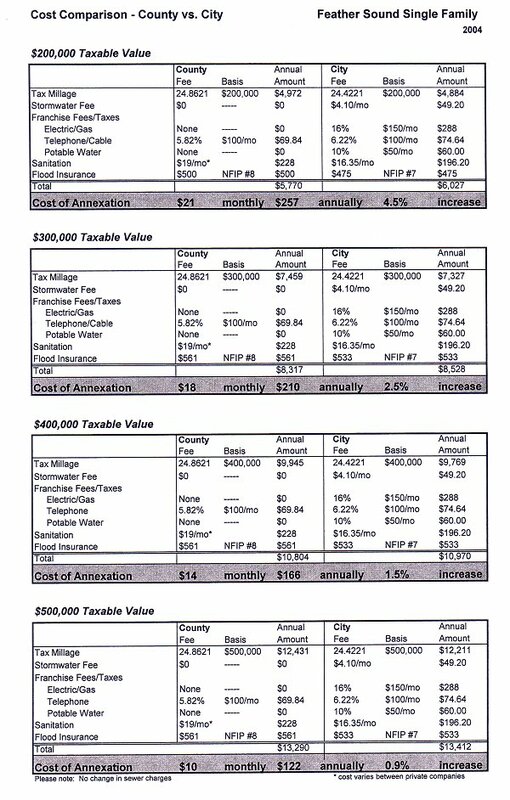 The City of St Petersburg has now prepared a similar cost analysis which is included in several pages of information being distributed in the meetings being held with residents. The City's analysis shows that the cost of annexation to residents will increase under each of the four taxable value examples presented. The increases range from 4.5% for homes with a taxable value of $200,000 to .9% for homes with a taxable value of $500,000. The first of several informal discussions initiated by St Petersburg city officials was held on Tuesday evening November 18th with residents of LakePointe Villas, a homeowners association in Feather Sound. Present at the meeting were Mayor Rick Baker, three other city officials and 7 Lake Pointe residents. Topics of discussion included issues regarding the airport, garbage and sewer services, lighting, water quality, roads and mailing address changes. City officials asked residents at the meeting what they would like to see improved in these areas. Residents generally agreed that if annexation were to come to a vote they would like to see a document stating the improvements in services that would occur. Promises made before a vote that were not kept afterward would be unacceptable. Documents distributed by the city officials at this meeting may be viewed below. The eighth discussion group was conducted on Monday December 15th 2003. A full report on this meeting can be viewed here. The letter from the City of St Petersburg also suggests that improvements could be made to the entrances to Feather Sound. The entrance at Feather Sound Drive across from the new Publix was recently improved with landscaping, lighting and a new fountain at the cost of approximately $150,000. Improvements to the entrance at Egret may be considered by the FSCSD pending a resolution of the road improvement projects proposed by Pinellas County. Another improvement the FSCSD has recently initiated is the replacement of all the fiberglass light poles and fixtures under the control of the taxing district. Florida Progress has now replaced the old poles with attractive concrete composite poles and fixtures. John Morroni, Pinellas County Commissioner, former board member of the FSCSD and Feather Sound resident has stated that he will be discussing with Pinellas County Administrator Steven Spratt the possibility of holding a meeting for Feather Sound residents to provide information regarding annexation issues. Letter from Commission John Morroni regarding annexation. Articles in the St Petersburg Times regarding this issue and related topics. The legislature will continue to be a significant factor in the annexation process as future legislation is proposed. For more information regarding this see the link below under Pinellas County Annexation Issues. The Board of County Commissioners mailed a brochure to residents the first week of December 2003. The brochure describes services and benefits provided by Pinellas County and has a table comparing the costs of living in the county to living in St Petersburg. What's your opinion? Post it in the Forum. It has been awhile since I last corresponded with the Feather Sound Community and I want to provide you with an update about annexation activities that ate taking-place in and around Feather Sound. Over The past several months I have learned a lot about your community through individual contacts and the numerous neighborhood "coffees" that we have conducted. Our discussions have been frank and honest, and I appreciate the candor of the sentiments expressed. Thank you for inviting us into your community and taking the time to talk with us. From the beginning of this discourse, I have always maintained it is the City's position that annexation would be proposed only if there is clear support for annexation in your community, and only if it makes sense for the City. To this end, I have been delighted by the reception we have received to date, but the City has made no decision whether to seek additional annexation at this time. One of the issues that came out in our discussions was the need to improve the visual quality of the Heron and Egret Drive entrances to Feather Sound and to improve the roadway surfaces. 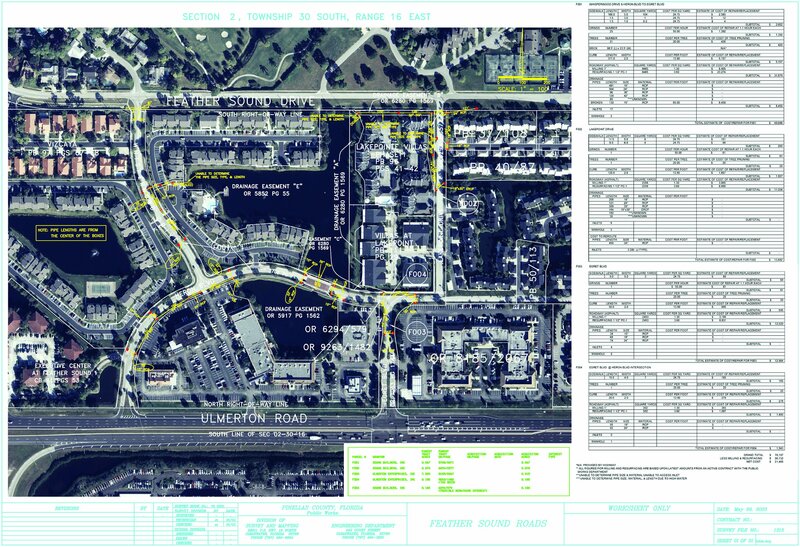 In response we have annexed, through the cooperation of two property owners, a portion of the Ulmerton Road commercial frontage and the associated roadways including Heron and Egret Drives. On August 14th of this year, we assumed ownership and maintenance responsibility of those roadways. On August 16th , work commenced on the installation of the entryway beautification and maintenance project which includes landscaping, decorative streetlighting, and resurfacing of the roadways. The total budget for this project is $425,000. Please excuse us for any inconvenience the project may have caused you during the construction phase. We hope you are pleased with the results and welcome your comments. The Weedon Island Preserve South has been in the City since the 1920's. As you may know, earlier this year we annexed the Weedon Island Preserve North which is located north and east of Feather Sound. We are excited about becoming a partner with the State of Florida and Pinellas County in the continued protection and management of this valuable and pristine natural resource. I look forward to further discussions with you and your neighbors regarding the future of Feather Sound and the City of St. Petersburg. If you would like to participate in discussions, please contact Gary Jones at 893-7877. It has been a pleasure getting to know your community. On November 4th, I wrote you to let you know that in response to inquiries from some of your neighbors, we intended to have small "coffee" gatherings in your community to discuss the possibility of an alliance between St. Petersburg and Feather Sound. We have now held a number of coffees throughout your neighborhood, but we have received more requests from hosts than we have been able to accommodate before the end of the year. In order to meet their requests we will continue these coffees through the first couple weeks in January. I had promised to report back to you in December so, even though we have not completed our initial review, I want to give you an update. I have personally attended most of the coffees and have found them to be terrific, candid discussions about your community. My impression is that your neighbors are very proud of the Feather Sound neighborhood, and very desirous of protecting your high quality of life. We have talked about roads, street lights, bike lanes, drainage, and other services. We have also discussed taxes, both what they are now, and what they may be in the future. We have received many comments relating to the need for Feather Sound to speak with one voice in order to protect its quality of life into the future. Obviously the County's presently tabled plans to convert Airco golf course to other uses is a very volatile subject. I have directed my legal and development staff to thoroughly review this proposal both in terms of legality and desirability. It is clear to me that the independent interests of the Feather Sound residents need to be addressed and protected. It is my intent to provide you with another update on our evaluation within the next month or so at which time our common goals and future can be better defined. I am committed to a thoughtful and careful review of your community issues and concerns, and therefore appreciate your patience in waiting for this information. Until we talk again, my very best wishes for a happy holiday season and a prosperous New Year. I have recently received a number of inquiries from your neighbors asking me to explore how Feather Sound and St. Petersburg might share a common future. Before we begin even a preliminary review I wanted to first personally communicate to all residents of Feather Sound so that there is no question or secret as to our intent or process. We intend to have informal discussions with small groups of residents to determine if there are any needs which exist within your community which might make alliance with our city a positive thing. At the same time we intend to perform an internal review of the costs and benefits to our city of an affiliation. Obviously, we will not even proceed with a serious discussion unless our preliminary review tells us that it is likely a good thing for St. Petersburg and that there is a significant level of support among the neighbors of Feather Sound. In no case will any affiliation take place unless, after fully exploring all related issues, the neighbors of Feather Sound vote in favor of joining with St. Petersburg. In our informal discussions with those residents who have contacted us we have heard many reasons for their interest. 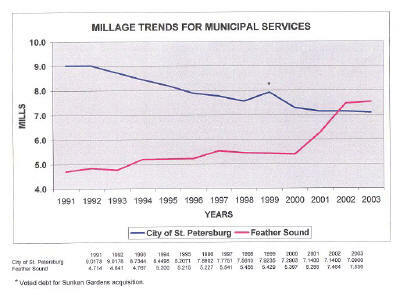 The fact that St. Petersburg's property tax rate, at 7.09, has decreased for 10 of the last 12 years is significant, especially when compared to the 7.53 millage rate paid by the residents of Feather Sound for comparable municipal related services; however, I do not believe that taxes or costs alone will be the determinating factor. The question which we have heard many times from some of your neighbors is whether being part of St. Petersburg can help Feather Sound, already a special place, become one of the premier communities on Florida's west coast with an even better qualify of life. Suggestions which we have heard so far include improvements to entry roads which are presently in disrepair; establishment of significant entryway markers/landscaping at both entrances, as we have already done in many of St. Petersburg's existing neighborhoods; inclusion of Feather Sound in St. Petersburg's $12 million master bicycle path and sidewalk pedestrian plan which starts construction next January; the review of park development opportunities; and others. Some have suggested that Feather Sound needs a stronger voice in representing your interests in issues such as the county's proposed development of Airco into an industrial park. St. Petersburg prides itself in the quality of our neighborhoods, and our willingness to vigorously advance, as well as defend, that quality. But even with the input received so far I recognize that we still have a lot to learn about your special community and its needs. Over the coming weeks members of my staff will be meeting with some of your neighbors in small groups in an effort to identify the needs and desires of Feather Sound. When possible, I will personally attend these meetings in order to hear what the community has to say. In December I plan to write to you again to report what we have learned about Feather Sound. If we decide not to proceed with further discussions, either because it is not in St. Petersburg's best interests or because there appears to be little interest from residents, then I will report that to you. In that case we will at least have gotten to know our neighbors a little better, which I believe is a good thing. If we decide to continue discussions then I will report what we have heard from you and your neighbors about ideas for physical improvements, improved services, and improved representation which an affiliation might make possible. I have deliberately chosen a slow, cautious approach because it is important for everyone to understand that we are not aggressively seeking annexation of Feather Sound into St. Petersburg. We are responding on a preliminary basis to inquiries received, in an effort to determine whether an affiliation may be a good thing for St. Petersburg, and desired by you and your neighbors. In the meantime should you have any questions, or if you would like to participate in further discussions, please either call the Mayor's Action Center at 893-7171 or email to mayor@stpete.org to leave your contact information. A member of staff will return your call promptly. I look forward to learning more about your community, and hope to have the chance to meet you soon. The City of St Petersburg is distributing the documents below to Feather Sound residents in informal discussions being held in November and December. *(General Fund, mosquito control, health dept. & EMS) Note: For a personalized comparison of the costs and/or savings associated with annexation into the City of St. Petersburg please contact Gary Jones at 893-7877 or by e-mail at gary.jones@stpete.orq. The chart above and the two pages below are being distributed by the City of St. Petersburg in talks with Feather Sound residents. Click on the images below to view them full size.